One of the best collections of historical Dallas photos — and certainly one of the easiest to access online — can be found in SMU’s DeGolyer Library. I can’t say enough good things about the astounding quality of their vast collection or the willingness to make large scans of their photos available online, free to share, without watermarks (higher resolution images are available for a fee, for publication, etc.). I love you, DeGolyer Library (and all the people and entities behind your impressive digitization process)! When going through recently uploaded photos, I came across three showing the same intersection in three different decades: the southeast corner of Elm and Akard streets (now the 1500 block). The building appears to be the same in each of the photos, and that is interesting in itself — but I was excited to find a connection in one of them to one of my favorite weird Texas historical events. And that is the photo below. It’s a cool photo — there’s some sort of parade underway, but it’s weird to say I didn’t even really notice that right away — there’s so much else to look at. This is Elm street looking toward the east (or, I guess, the southeast). The photographer is just west of Akard Street. At the bottom left of the photo is the United States Coffee & Tea Co. (which I wrote about here); in the background at the right is the Praetorian Building on Main; and just left of center is the Wilson Building addition under construction (which dates this photo to 1911). But the building that interested me the most is the one at the bottom right, the one at the southeast corner of Elm and Akard. I noticed “Deane’s Photo Studio” on the exterior of the upper part of the building. I recognized the name, having seen it on various Dallas portraits over the years, but now I realize there were two photographers named Deane in Dallas in the first half of the 20th century: Granville M. Deane (who had a longer career here) and his brother, Jervis C. Deane — J. C. Deane was the photographer who occupied the upper-floor studio at 334 Elm (later 1502 Elm) between 1906 and 1911. His studio was above T. J. Britton’s drugstore. J. C. Deane (born in Virginia in 1860) worked as an award-winning photographer around Texas, based for much of his career in Waco. He was in Dallas only a decade or so, leaving around 1911, after a divorce, noting in ads that he had to sell his business as he was “sick in sanitarium.” After leaving Dallas he bounced around Texas, working as a studio photographer in cities such as Waco and San Antonio. I have been unable to find any information on his death. I’ve been fascinated by the Crash at Crush ever since I heard about it several years ago, and now I know there’s a Dallas connection — and there’s even a photo of the building where he worked. In November, 1941, Elm Street’s Theater Row welcomed a new occupant, the Telenews theater, which showed only newsreels and short documentaries. 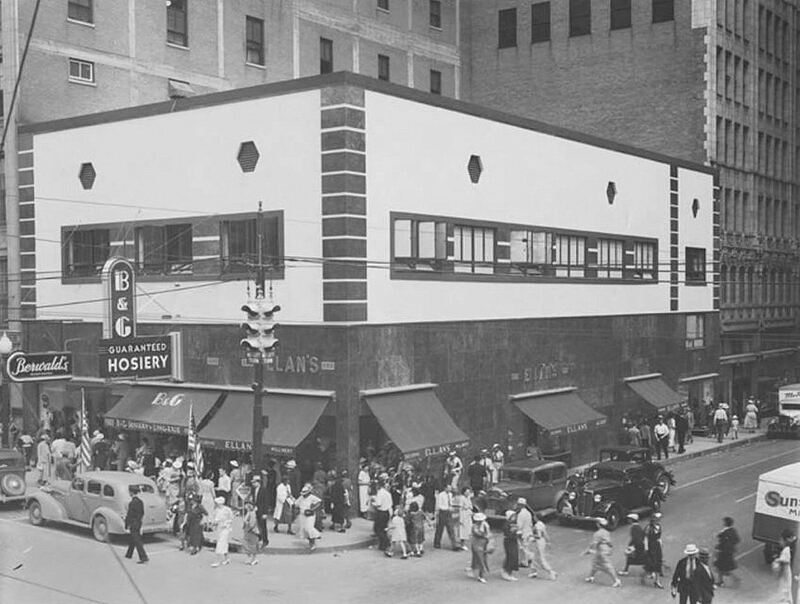 By that time the A. Harris Co. had purchased the building at the southeast corner of Elm and Akard and expanded into its upper floors. Telenews opened at the end of 1941 and Linen Palace was gone from this Elm Street location by 1943, dating this photo to 1941 or 1942. All of these are such great photos. Thanks for making them available to us, SMU! The three Dallas photos are from the George A. McAfee collection of photographs at the DeGolyer Library at Southern Methodist University — some of the photos in this large and wonderful collection were taken by McAfee, some were merely photos he had personally collected. The top photo (taken by McAfee) is listed on the SMU database with the title “[Looking Southeast, Corner of Elm and Akard, Kirby Building at Right]” — more info on this photo is here. 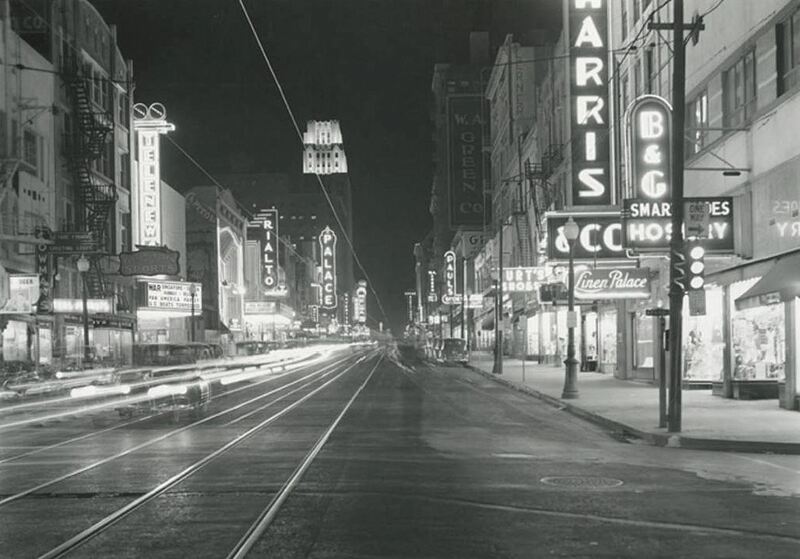 The second photo, “[Looking East on Elm West of Akard / Praetorian Building (Main at Stone) Upper Right Center]” is not attributed to a specific photographer; this photo is listed twice in the SMU database, here and here. 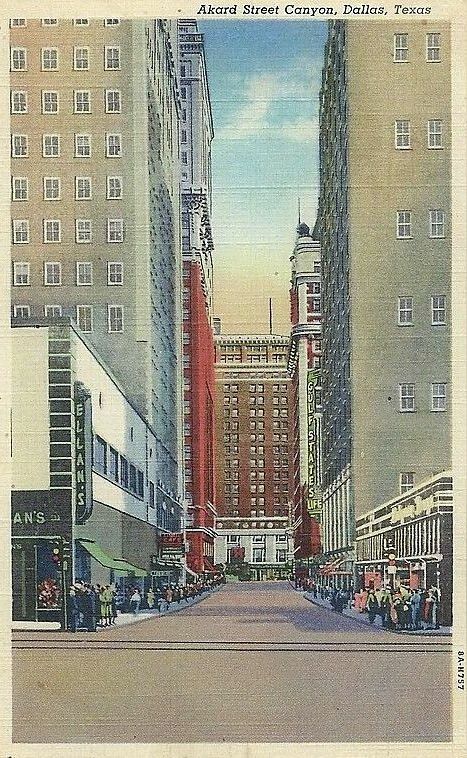 The third photo, “[Looking East on Elm from Akard on “Theatre Row” (Including on North Side on Elm from Left to Right — Telenews, Capitol, Rialto, Palace, Tower, Melba and Majestic],” appears to have been taken by McAfee, and it, too, appears twice in the online digital database, here and here. 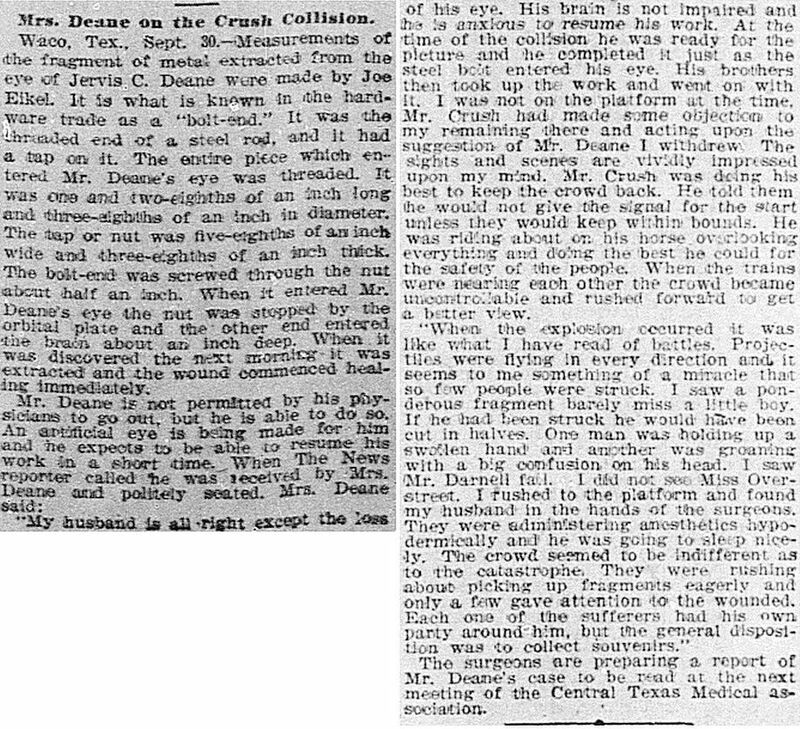 The three photos from the “Crash at Crush” event are attributed to Jervis C. Deane, and were taken on September 15, 1896 along the MKT railroad line between West and Waco; the images seen above appeared in the Austin American-Statesman on Sept. 16, 1962. More on the Crash at Crush from Wikipedia, here — there is a photo there of the historical marker and, sadly, Jervis Deane’s name is misspelled. Sorry, Jervis! Read the Dallas Morning News story of the train collision aftermath in the exciting article lumberingly titled “CRUSH COLLISION: The Force of the Blow and Damage Done. Boilers Exploded with Terrific Force, Scattering Fragments of the Wreckage Over a Large Area. 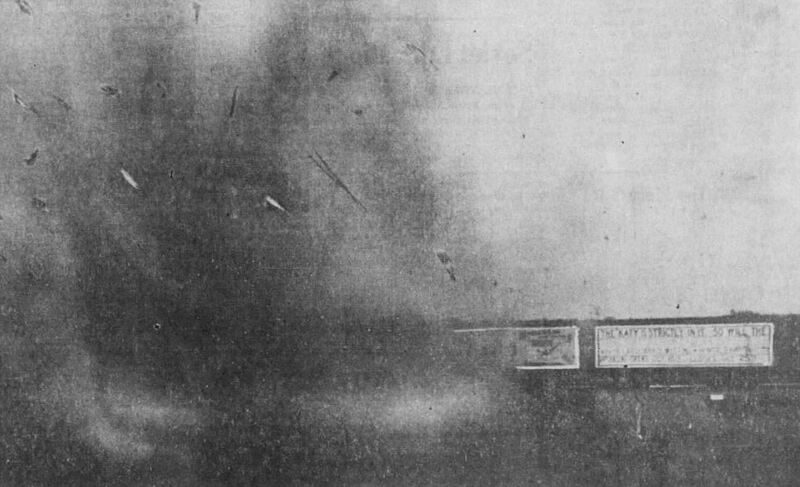 The Showers of Missiles Fell on the Photographer’s Platform Almost as Thick as Hail – Description of the Scene,” here. The southeast corner of Elm and Akard is currently home to a 7-Eleven topped by an exceedingly unattractive parking garage — see the corner on Google Street View here. 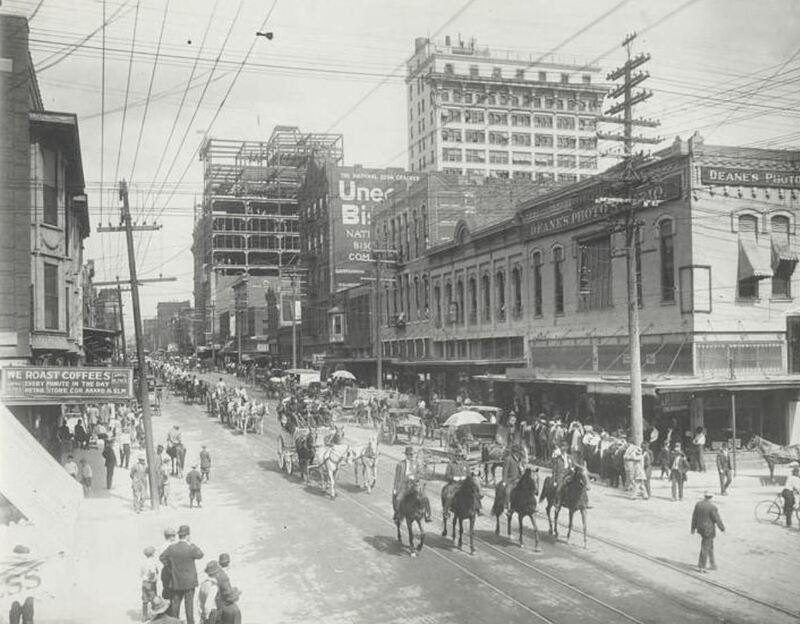 There is a handy Flashback Dallas post which has TONS of photos of Akard Street, several of which have this building in it: check out the post “Akard Street Looking South, 1887-2015,” here. What a coincidence! I was looking through photos of the George A McAfee collection today and found two more that were simply identified as “Crowd at Train Wreck.” I submitted a “Crash at Crush” tag for each. They were taken right after the locomotive crash. Wow. I’ll have to go look for those when I’m back at my computer! Paula: There’s more of a Dallas connection. You are aware that William George Crush, the Katy agent who orchestrated the staged collision, is buried at Calvary Hill Cemetery, aren’t you? What I find most interesting about the photo of the corner of Elm and Akard is the sign painted on a building in the background in a sans-serif font, which was almost unheard of at this time. There are in fact several signs that I wish I could get a closer look at; is this the highest resolution available? The B&G Hosiery photo is less Art Deco and lots more Art Moderne, a European style that never much caught on over here. Surviving examples are often mis-tagged as “mid-century modern”.